Mobile Engagement Platforms (MEPs) specialize in the creation of user segments and the orchestration of customer communication. 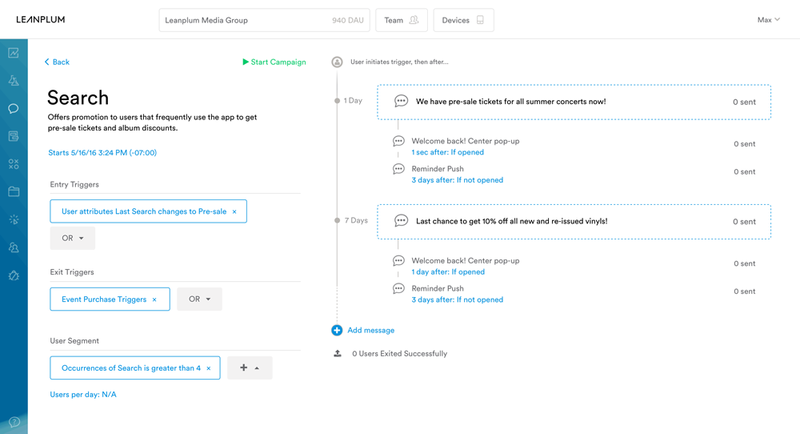 Modern MEPs enable marketing teams to use all popular communication channels including: push notifications, in-app messages, SMS/MMS, email, and social media. MEPs enable the creation of complex customer journeys with low to none developer intervention. For most mobile apps, the use of an MEP increases user engagement rates, generating a higher user LTV (Lifetime Value). Before looking at how Neura can contribute to MEP functionality, let’s first look at how MEPs work and how they are being used in the industry. MEPs provide mobile engagement data in one platform in order to answer most (if not all) of a mobile marketer’s needs. Some of the information is gathered and driven from the MEP’s SDK itself, while other types of data are integrated to the MEP from third-party sources. Mobile engagement platforms ensure that any gathered information is enabled for cross-channel messaging. This means that push notifications, in-app messages, and even email campaigns share the same data and analytics for each user to help marketers optimize campaign results. What do mobile marketers do with MEPs? The first, and most important, action of an MEP, once integrated, is to gather engagement data by measuring user responses and conversions for any campaign or in-app event. This information is used to create user profiles—grouping customers into segments. Users are then messaged and approached in accordance to their segmented web and in-app behavior. In addition, MEPs allow marketers to address users by name or approach them with an offer that’s relevant. Marketers who tailor messages based on segments from multiple data channels find them quite effective, as they usually generate an increase in user engagement rates. However, since in-app-activity-based segmentation is only partially based on personalized attributes, most of the engagement uplift driven from personalized communication cannot be unlocked without moving one step further. How can Neura enrich MEPs to dramatically impact engagement? Mobile marketers who aim to communicate one-to-one with their users need to access an additional level of user understanding. This can be unlocked by uncovering the human context behind digital activity: how do users interact with the app in the real world, in their daily lives. While user location data is important, user context in a certain location can provide enormous value for a marketer aiming to personalize and time their campaigns. Is the place home? Work? Is the user arriving or about to leave? In the same manner, situation and real-world activity (Commuting? Hanging out? Idle? Sleeping?) and, of course, real-world behavioral traits (Morning Commuter, Early Riser, Avid Runner, Busy Person, Workaholic) have the potential to increase engagement much more than any standard analytics data. As seen above, segmentation relies on user in-app activity, web-based data, and sometimes location data. This example campaign is set to prevent from firing in certain conditions and to initiate different communication attempts in case of ignored messages. These decision trees are highly effective when it comes to maintaining healthy communication and avoiding notification fatigue. The major downside in this example is the fact that the real-world context is not taken into consideration. If it fires “3 days after,” it can fire while the user is sleeping, working, or driving—preventing the campaign from reaching each user at moments of receptiveness. Here’s how a Neura-based campaign from within an AP looks like for a taxi app that is trying to increase morning usage. With Neura, the mobile marketer is able to approach users who are identified as Morning Commuters. The identification is made based on users’ real-world behavior, not in-app activity, which means that a larger share of the customers can be approached while ensuring that the offer is highly relevant to all of them. Timing the campaign properly is crucial for its success. A standard MEP promotion would have a marketer pick a time when most users are predicted to be awake and available to engage with the message. If the campaign is triggered at 8:00am, for example, some users will surely be reached at the right moment, while for many others it might arrive when they’re still asleep, not ready to leave home, or already at work, based on their morning routine. An MEP promotion that is based on a Neura event triggers the promotion to be sent only to users who recently woke up. This ensures that the recipients receive the promotion while it is still relevant and can provide value to them. The results speak for themselves. How does Neura data plug into MEPs? Neura can be easily integrated with any CRM or MEP. With a simple exchange of API keys, Neura data enhances segments and triggers in your CRM roadmap. Events and user reactions to campaigns flow back to Neura and used for further campaigns optimization. Human context is the next generation of segmentation data. With it, marketers using MEPs will be able to extract human traits and real-world situations to create human-centric profiles and CRM triggers. For apps across all verticals, the advantages of real-world contextualization and segmentation for engagement and user LTV are clear. Mobile Engagement Platforms that fail to progress will be left behind.